Want to give paddle boarding a go? Tried it once and got the bug? Whether you are a complete newbie or a keen paddler, exploring the lake by SUP on your Log House Holiday will surely be a highlight. It’s the perfect spot – 100 acres of still flat water all to yourselves. 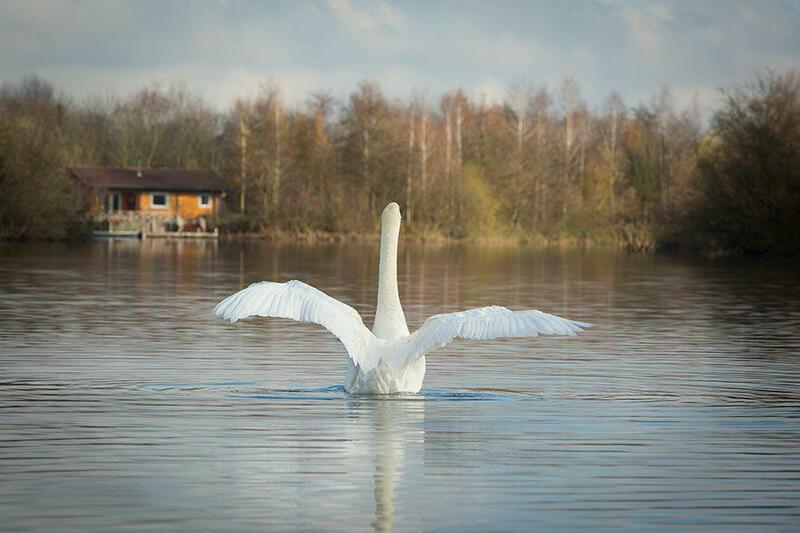 With just 8 luxury lake cabins sharing this large nature reserve, you’ll be away from the stresses of busy everyday life and lost in what is turning out to be England’s fastest growing sport. Our first time trying paddle boarding. What a great way to explore the lake! All of our paddle board kit is made by Red Paddle Co and Starboard. Their top end equipment makes this new sport easy for all abilities. These large, stable boards are great for learning on and there’s no reason for you really to fall off! Pus they’re big enough to even take a passenger whilst still being responsive for developing new skills. We also choose these with safety in mind as their inflatable design is much more forgiving and the paddles are fully adjustable for all heights – great for holidays with kids. Exploring the lake by board is not only good fun but they’re great for fitness holidays too. We fell in love with the sport after paddle boarding on the lake ourselves and we just couldn’t resist getting some boards in for our guests to enjoy too. With 16 islands and many coves and bays to explore, you can spend hours out on the boards. Hire a few boards so you can enjoy this sport with the whole group, or race each other to the finish line! From still calm evenings watching the sunset (a must for that romantic weekend away) to misty mornings around the gravel islands, exploring the lake by paddle board is a dream. Due to their large inflatable design, they are perfect for just lying back on and drifting around the lake during a relaxed summer’s day. 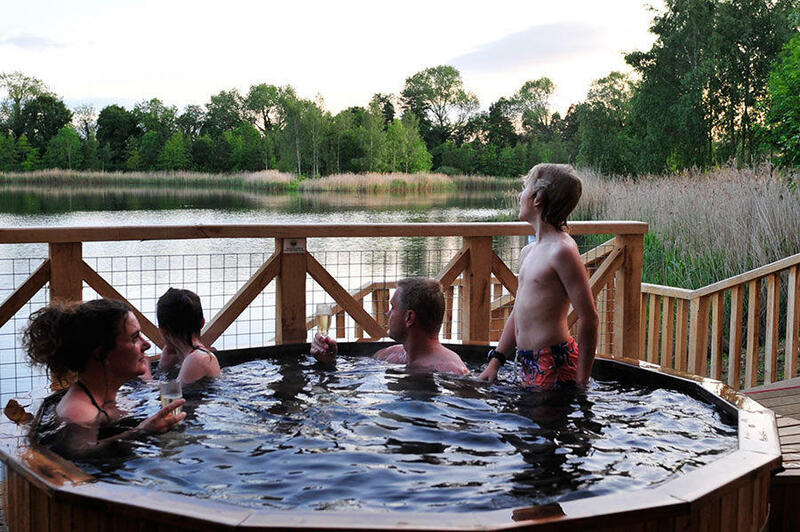 After discovering the lake, or chilling out on the board all day, you’ll appreciate coming back into your private beach and finding the steaming lakeside hot tub and fire pit that is waiting for you back at your cabin. There are lots of other luxuries too from big comfy beds with crisp white linen, fluffy towels and under floor heating to a cosy wood burner supplied with logs so you can enjoy complete luxury on your paddle boarding fitness getaway. Beautifully furnished with local antiques and kitted out with stylish kitchens and bathrooms, your eco-friendly cabin will be worth paddling back for. Each retreat even comes with its own rowing boat so you can take to the lake in more relaxing manner. You don’t need any experience whatsoever to hire our SUPs. However, if you are interested in progressing your skills you could arrange tuition on the Stand Up Paddle Board lake just 5 minutes’ drive away. They run great courses, as well as the recommended private three-to-one sessions. During these session, they can focus on whatever your goals are – be it new skills or improving fitness.